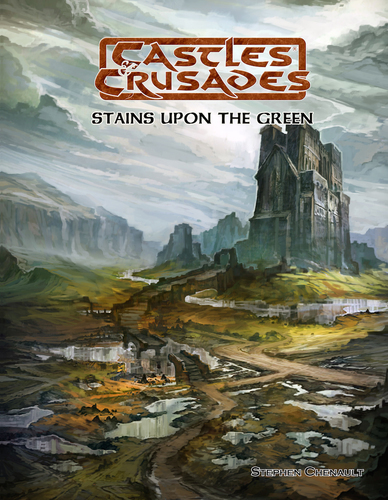 Stains upon the Green thrusts the characters into the Tar Kiln, where the ruins of an old dwarven ring fort offers them refuge from the wilderness and its many dangers. Beyond the parapet's walls and the ruined barbican that breaches them stands a keep, built on these borderlands long ago. Abandoned now to the wilderness, its secrets are ripe for the taking. But within it lies a secret portal that others wish to use, to bridge the gap between worlds. The adventure is set upon the borderlands known as the Tar Kiln, a wilderness that lies beyond the northern marches of the Kingdom of Kayomar. Here the rolling hills and mixed pine and hardwood forests give refuge to creatures great and small; boars the size of ponies, giant wolves, and massive cave bears. There are also bull headed men and long toothed tigers, grim faced giants, and trolls. They come for the hunt, for the elk and deer are plentiful and large. It is a broken country, littered with tar pits that lay in bleak silence like stains on a canvas. It is designed to introduce characters to the Rings of Brass, magical portals that lead to dwarven roads carved through the planes. It is specifically designed for use in bridging the Lands of Ursal in Aihrde with the Free City of Eskadia in the Haunted Highlands. It is modular however, allowing its use in any setting of the Castle Keeper's choice. The plane travel aspects are not germane to the adventure and can be discarded if desired.